First off, wishing a very Happy Independence Day to all of you and yours! Later this month Moonstone Publishing will bring us Werewolves of New Idria, an illustrated novel / trade paperback written by John Chadwell with art by Duncan Long. Here’s the publisher’s description: ” The Aceves family is like no other. With patriarch, Roberto Aceves, forever a Spanish knight after being bitten by a werewolf, he and his clan have secretly fought man’s wars for 900 years. 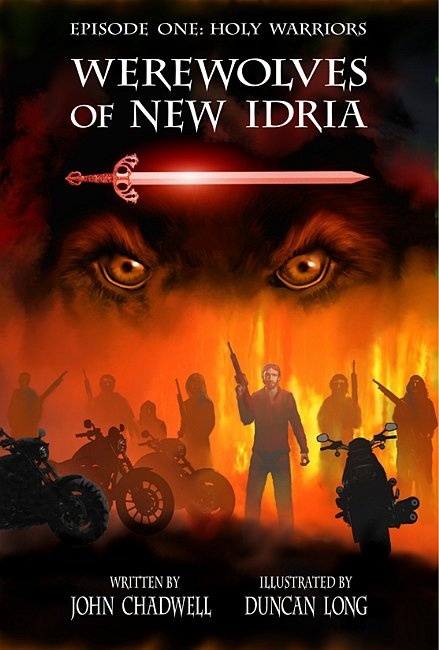 Today, near the abandoned mining town of New Idria, they must battle against a demon and his biker gang who want nothing more than to destroy the entire clan. A new breed of werewolf! Holy warriors, led by a 900-year-old knight who fought beside El Cid, now in a deadly struggle against a motorcycle gang headed by Satan’s ken, hell bent on revenge!” Check out the pre-order page at Amazon.com. Thanks for the mention of my upcoming graphic novel, "Werewolves of New Idria." I'm curious about how you were notified and what date you have for its premiere. I'm under the impression it's coming out Aug. 29. Do you have a different date? Also, who notified you: Moonstone or a distributor? Hello JC, nice to hear from you! I found out about the work through Previews magalog, and then went out doing some Internet research for my article. Well, I hope it happens this time. It's been derailed for on reason or another for some two years. I'm anxious for it to be out because I'm hoping there will be enough reader interest that will warrant sequels. With 900 years of history, the Aceves family can have many adventures. Being a history buff, I'm sure they will mix it up with some notable villains, real and fictional. If you should want to do an online interview about the book and how Duncan Long and I worked on it together, let me know. I hope Moonstone sends you the book for review. I think it's a different kind of horror story. It may turn some folks off, but I think it's a good tale. Chapter One: Holy Warriors ought to give you a clue. 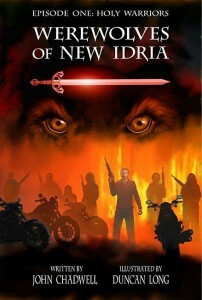 I forgot to mention, you can follow Werewolves of New Idria on Facebook http://goo.gl/ddSeu. I haven't added much in a while because I've been waiting for confirmation that it is indeed coming out. They told me it is, so I'm hopeful.